Market leaders in this line of business - New India Assurance and Tata AIG - have begun to reassess the premium on risk exposure of their portfolio in the director’s and officer’s liability business. Market leaders in this line of business - New India Assurance and Tata AIG - have begun to reassess the premium on risk exposure of their portfolio in the director’s and officer’s (D&O) liability business. “The rules are simple. If there is a claim, our policies are locked in for payout for years, so it is better to renegotiate now,” said a top source in the non-life insurance sector. Insurers are in a hurry because as in the health and fire businesses, premiums have been reduced to a minimum. Most of the listed banks buy insurance policies to cover the action of their directors on the boards against any claims, whether of shareholders or customers or even other stakeholders. “ICICI Bank and HDFC Bank, which are listed abroad, have D&O policies that would be valued at $100 million,” said a senior executive of a company that sells liability insurance. But other banks too have signed on to these policies. Insurance companies do not divulge the client-wise premium they have booked, but sources say the combined exposure of these banks could be close to Rs 100 crore. The risks for non-life insurance companies have risen sharply because of the non-performing asset crisis. Insurance companies, through D&O policies, offer cover to firms against claims made by shareholders, customers or any other stakeholders for supposed losses suffered by them because of the actions of the boards of companies. This includes the money to pay for legal action to defend board members against class action suits that may be filed by investors. ICICI Bank chief executive officer (CEO) Chanda Kochhar is in the middle of a controversy over her role in sanctioning a Rs 3,250 crore loan to Videocon. The company, in turn, had allegedly invested in NuPower, run by her husband, Deepak Kochhar, in 2010. He has come under the scanner of the Central Bureau of Investigation, which is investigating allegations of a quid pro quo. In unrelated developments, Axis Bank CEO Shikha Sharma, who had been given an extension of her term by the bank’s board, has been asked by the Reserve Bank of India (RBI) to step down. And, public sector Punjab National Bank has been buffeted by controversies on whether its board should have been more vigilant in monitoring its human resource as mandated by the RBI. He said it made sense for financial companies to apprise insurers about the risks before any “insurable action” starts. “I believe the news flow has started,” he said. Insurance firms are rushing in because April is the month when they place their reinsurance business. At least one leader of the reinsurance business in a state-run insurance company said the rates for taking out cover against liability insurance had risen this year. The risks for professional liability insurance have suddenly risen because of the boardroom battles coming to surface in Indian banks. “No one expects those to match E&O, but things get complicated because the costs keep rising through successive court hearings,” said Swapnil Jain, senior associate at Tuli & Co, one of the major legal firms specialising in liability insurance. As the cases wind through courts, insured companies incur legal costs and keep billing insurers till the financial limit runs out. Even though the cover is for a year, once a claim is triggered it runs through the course of the case. 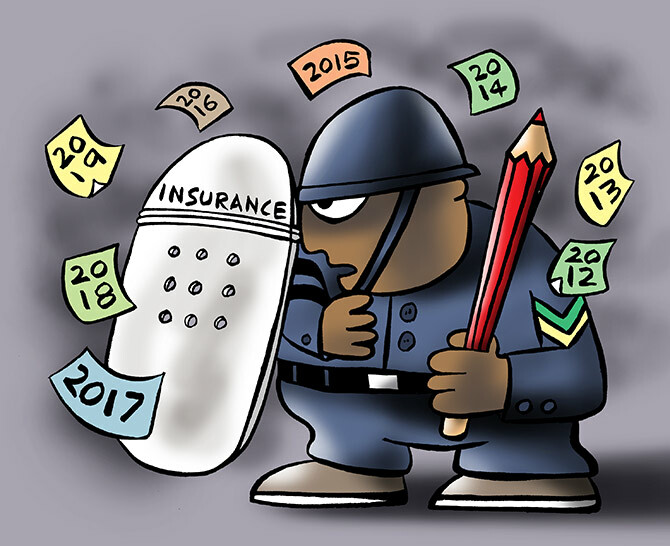 The Insurance Regulatory and Development Authority of India data shows industry-wide gross premium for liability insurance had clocked Rs 1,890 crore in 2016-17, rising at a compound annual growth rate of 14.7 per cent for the past four years. That the stakes are rising is evident from the action of industry bodies too. Last month, the General Insurance Council had sent feelers to independent directors of several non-life insurance companies about the risks they run in the case of the motor insurance business. Several of these companies had made aggressive deals with motor car dealers to secure preferential access to consumers to buy insurance cover. The deals have come under question from the indirect tax department, while the insurance regulator has warned the companies to institute checks and balances in the business. The directors have been advised by the Council to make their position clear for any eventualities. Will Salil Parekh manage to restore Infy's past glory?